This entry was posted on August 9, 2017 by B4S. What Skype for Business offers is the ability to leverage Microsoft's Unified Communications platform to set up meetings with anyone at any time. In fact it is possible to set up online conferences with up to 250 people irrespective as to whether they subscribe to Skype themselves. New Enterprise capabilities include an increased focus on several factors which are crucial to any business : security, transparency, privacy, ease of use and the ability to gain data insights. Unified Communications ( of which Skype for Business is a conduit ) is a term which describes the "integration of multiple enterprise communication systems accessible from multiple devices." - this means that once should be able to access video conferencing, private messaging, voice calls, data etc from a range of endpoints which include mobile phones, headsets, telephones, tablets, PCs etc. Of course this means that strict protocols and industry standards need be maintained to ensure a consistent and user friendly experience. 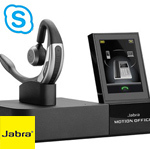 Manufacturers such as Polycom, Plantronics, Jabra, Yealink and Sennheiser all are accredited Microsoft Technology Partners which allows them early access to developments so that they can deliver cutting edge, certified products which will tale full advantage of any new features or improvements to the platform. It is interesting to note that the rise of such platforms is a part of the concept of "consumerisation of IT" - this is the way in which the increase in personal usage of relatively high end IT products has increased expectation in the workplace. When someone finds it incredibly simple to set up a three way conference video call on their mobile at home it is nt difficult to see that, in business, they will expect similar and even better features and performance from their products - some of which are shown below. This could be seen as the future of Unified Communications - a lightweight, unobtrusive headset which fits over one ear and which is powered and charged by a solid controlling base station. The base itself houses a colour touchscreen to access a range of call handling and enterprise features. This headset can connect to softphone, deskphone and mobile. A worker can easily wear this all day( it boasts up to 360 hours standby time ) and connect to all devices necessary - even coming with a micro USB adaptor for PC connection when on the move. Whilst the highest performance Conference units will cost upwards of several hundred pounds we have to admire the simplicity and portability of the Sennheiser SP 20 Speakerphone. Rather than one of Polycom's 'spider phones' which can handle large meeting rooms this is perfectly aimed at the UC/ SFB adopter. 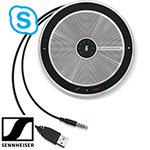 It is, in its essence, little more than a portable and self powered computer speaker ( connecting via USB or 3.5mm jack ), but in reality it is a high powered and fully duplex conference unit which has incorporated many of Sennheiser's bespoke sound enhancing features such as Voice Clarity, Echo Cancellation, HD Sound and a Noise Cancelling and fully duplex microphone. 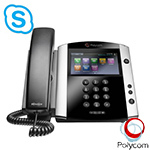 At first phones were telephones and then they became IP phones, then IP endpoints and now we have the IP Media phone - the Polycom VVX 601 has a large touchscreen display via which one can access a full range of options which include not only voice, but video conferencing as well. It has two usb ports as well as a traditional RJ9 headset port. The phone can be powered over ethernet ( POE ) which makes deployment over Unified Communicatiosn ( or Skype for Business naturally ) all the more convenient.